Health / News Shumlin Dismisses Legislative Consultant's Single-Payer Alternative as "Old Idea"
Gov. 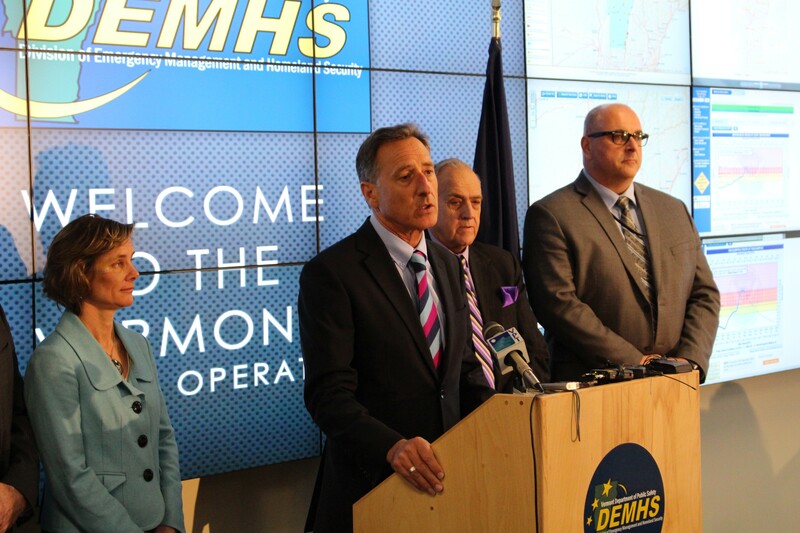 Peter Shumlin speaks Wednesday at the state's Emergency Operations Center in Waterbury. What does Gov. Peter Shumlin think of Plan B? That is, the legislature's top-secret alternative to his own top-secret single-payer health care plan? Speaking Wednesday morning at a Waterbury press conference, the gov weighed in on a newly leaked memo outlining a scaled-back approach to increasing health insurance coverage in Vermont. Written by legislative consultant and Emory University professor Kenneth Thorpe, the proposal has been whispered about for weeks in the halls of the Statehouse, but was first publicly revealed Tuesday by Vermont Public Radio's Peter Hirschfeld and Hamilton Davis. The way Shumlin sees it, there's nothing new or compelling about the alternative plan, which he said was based on "a failed model that hasn't worked." "It shouldn't surprise us that some folks are taking some old ideas and tunin' them up, puttin' em back on the table," he said. Rather than create a uniform single-payer health insurance system financed by across-the-board tax hikes, Thorpe's memo suggests sticking with a premium-based model, enhanced with federal and state subsidies covering those with incomes up to 400 percent of the federal poverty level. But according to Shumlin, that's not much different from what Vermont previously offered through Catamount Health, a premium-assistance program phased out with the advent of the federal Affordable Care Act. "What I've heard about the two-page memo is that it basically asks us to do what we've always done," he said. "Which is raise taxes on hardworking Vermonters to pay for people that can't afford health care and then ask Vermonters — the middle class — to also continue to pay rising health care premiums that they can't afford. It just — it hasn't worked." It's unclear how seriously legislators are taking this particular alternative, nor how many other concepts Thorpe has designed. Two weeks ago, Thorpe told Seven Days he was helping the legislature "think through different types of policy option designs and what they would cost." "I think the idea is that the legislature is going to want to look at different approaches and options for moving toward or transitioning into a single-payer plan," he said at the time. And while Shumlin was quick to dismiss Thorpe's proposal on Wednesday, he hastened to say that he was "not in any conflict with the legislative leadership, and they're not in conflict with me." "We looked at this model and we rejected it for a lot of good policy reasons," Shumlin said. "We've got to expect the legislature to do the same work — to do their due diligence. So we're not disagreeing in any way. "The legislature is doing the right thing," the gov said. "They're hiring folks to help them look at all the alternatives. And I suspect they'll come to the same conclusions that we did, which is the current system, whether you put it on steroids or not, will not work."